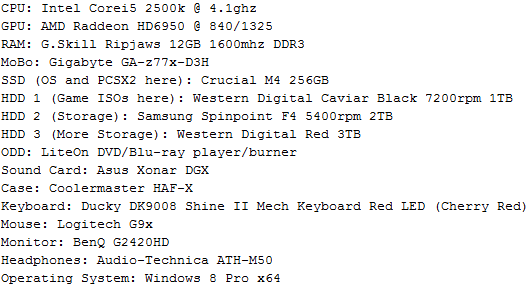 I don't know if you guys need more of my specs but I think these are the basics. Speedhack will help boost the speed alot but idk how stable it handles in that game. And you didn't post your GPU spec. Also why not upgrade to 0.9.8? Might provide some more stability. Zidanex we also would like to know which PCSX2 version you are using and which non-default settings. Also your CPU is definetly gonna be your biggest bottleneck with most games. They still do recommend to have a Quad Core @ 3.0 Ghz for most basic games and even a higher clocked Intel for the more heavier games. I new to PCSX2 so I really don't know what I'm doing. How exactly do I check my GPU specs? I edited the speed hacks to..
Use x2 Cycle Rate and I didn't check put a check on INTC Sync Hack, Enable IOP x2 Cycle Rate, or WaitCycles Sync Hack. I see a little difference in 0.9.8. Also I didn't change any of the settings at all everything in default. Do the same and we can go further. Also, what resolution is your monitor running at? You'll probably end up having to run it in Software mode but I'm not too privy with this stuff. My computer is quite powerful and runs all modern games on max settings quite well so I just cranked everything up to max and it works fine, never really had to fiddle around with settings in PCSX2 before - One thing you must do is keep the resolution set at native. You're not going to be able to run it any higher than that.